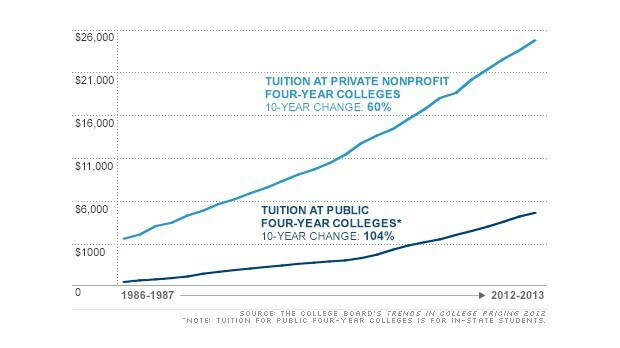 Techcrunch.com recently published an article talking about how college fees are continuously on the rise, and these costs are being passed to the students. 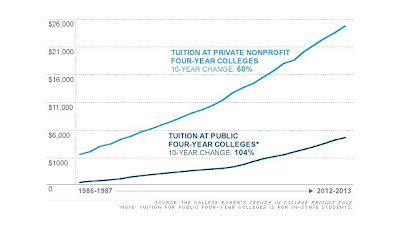 College tuition has increased over 1200% in 30 years. According to the College Board, the average debt of college graduates is a whopping $13,600, growing at 2.1% beyond inflation since 2005. Adding to the problem is the issue of hidden fees. Some universities in North America have added as much as 40% to tuition costs, as of 2007. As a result of the skyrocketing costs, California is considering stripping their university system of the power to deny online courses for credit. The largest university system in the world has already announced a pilot with Massively Open Online course (MOOC) provider, Udacity, for $150 remedial lower-division courses at San Jose State University. With operating costs (and therefore tuition fees) on the rise, some kind of regulation may be necessary. If not, how will students be able to afford tuition? Now is the time for all post-secondary institutions to consider online learning, at least as an additional option. It's an optimal way to reduce costs and pass on savings to students. This can in turn increase student enrolment and help colleges grow. Is your college using online learning? There are numerous options already available and the friendly people at Amperea can help! Our ampEducator software already links directly to Learning Management Systems (LMS) such as Blackboard. Want to know more? Contact us today.